S04xE06 – Due to Axl’s foot being broken by Sue and him being out for the entire football season, his scholarship hangs in the balance. So now Axl is required to try and get into college based on his smarts, which is going to be tough, so he gets a tutor. His tutor turns out to be cute, but strongly opinionated about jocks. So Axl thinking he can put on the charms and win her over, kisses her. She appears upset and leaves, but you see she’s secretly ok with the kiss. So it’s now up to Axl to learn his stuff on his own. Frankie starts dental assistant school, and makes a great first impression. Well not really, she shows up late and very nervous which doesn’t impress the teacher. And the confidence booster is non-existent when it’s time to take notes, and she has a paper notebook, and the rest of the class have their laptops. Poor Frankie. Sue and Brick are on their way to buy a healthy treat for Brick’s school class. Frankie has given them $40 with the sole intention that any change be returned to her once the treat has been purchased. 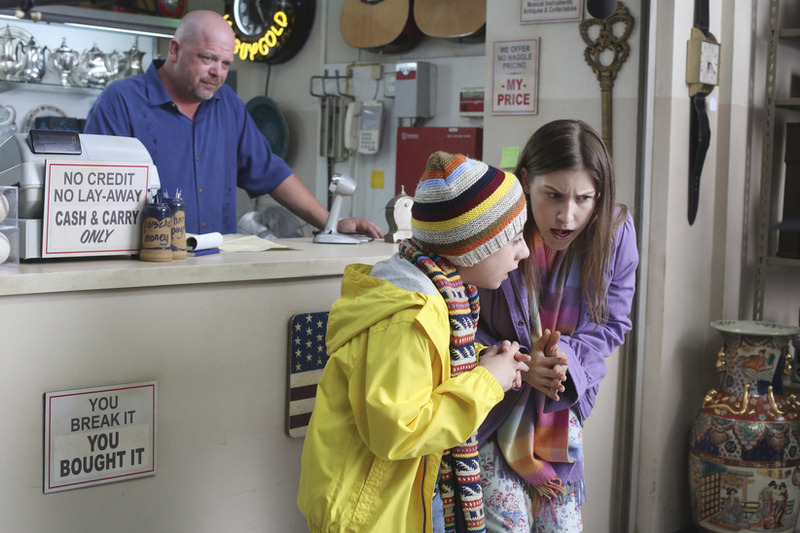 As Sue and Brick are walking along, they come across a yard sale where they find a door knocker that they believe they can get a lot more money for, so they purchase it and take it to a pawn shop. There Rick from Pawn Stars is behind the register and offers them $40 for the door knocker, they’ve just doubled their money, and they are ready to head out when Brick finds a safe. He’s convinced because he saw it on tv that the safe could contain money, so they let it ride and purchase the safe. Frankie goes to her second day of school and is again late for class. But to make up for it, she brings the teacher a plate of snickerdoodles. This doesn’t go over so well, because it’s gingivitis on a plate. This leads the teacher to believe that Frankie doesn’t respect the tooth, and then forces Frankie into the dental chair for a session of show and tell, where all classmates get to poke and prod at her teeth. That night both Axl and Frankie are discouraged over their homework, and it takes Mike to jump in and assist them. Frankie who has a headache after her mouth being attacked takes some tylenol, and Axl asks for some too. So as MIke is trying to help them prepare for their tests the next day, both Frankie and Axl start to act tired, and Mike realizes that the tylenol was the PM kind. So now it’s pretty much useless to get them to retain any information. Next day Frankie is in class taking the written part of her test, and feeling ok about it, they move onto the next part. The teacher picks on her to be the test subject for blood pressure taking, and as Frankie lifts up her sleeve, her arm is covered in writing. It looks as if she attempted to cheat. Really it was Axl in his drugged stupor deciding to help Frankie out by writing the answers on her arm. Not sure if they were the right answers, but it was a nice thought. Sue and Brick have been attempting to open the safe for a while now, and their last attempt is to vault it in hopes that a crash landing will open the safe. Well it does, but it also leaves a giant hole in the wall. They find in the safe a receipt that looks to be signed by Gerald Ford, so they rush over to Rick at the pawn shop and he is skeptical about the signature, but offers them $20 because he likes them. Brick and Sue talk amongst themselves and decide they can do better and decline the offer. As they are walking out they realize Rick’s right, the signature isn’t looking like Gerald Ford, but more like Gerard Furg. They go back in and try to accept the offer Rick made, but he rebuts offering them less, and when Sue starts to argue the offer keeps decreasing. Finally Sue and Brick accept it at $9 and leave the store. Axl who actually did alright on his test, a “B”, runs into his tutor Cassidy and tells her how well he did. They start talking and it seems like they may end up friends. Frankie is at home with Mike who is trying to repair the multiple things going wrong with the house when he decides the house is groaning because it’s tired like they all are. Frankie relates it to a dental term, and that makes her happy because she remembered something. She may do alright after all. Best of the episode: Brick and Sue trying to negotiate with Rick of Pawn Stars. Worst of the episode: Cassidy the tutor’s hair color. I’m not sure what color it was supposed to be, but it didn’t look good. Where did this episode leave us? : Both Frankie and Axel struggling through school, and Mike hoping on a prayer that Frankie’s schooling will be worth it.